Being a fan of Jon Stewart it maybe shouldn’t come as a surprise that his first foray into film is politically based. After all, he became famous for his comedic Daily Show diatribes against the US political system, corrupt world leaders and human rights atrocities. 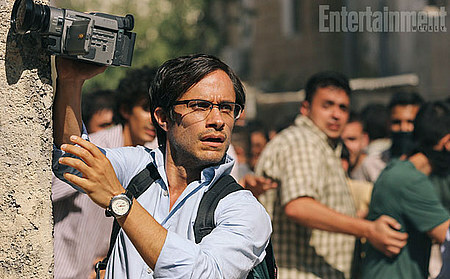 However, in his new film, Stewart uses the starting point of journalist Maziar Bahari’s (Gael Garcia Bernal) 118 day imprisonment for being a supposed spy in Iran, to craft a film condemning of any leadership that values not only political and religious hyperbole, but focuses mainly on the ignorance of its own people. 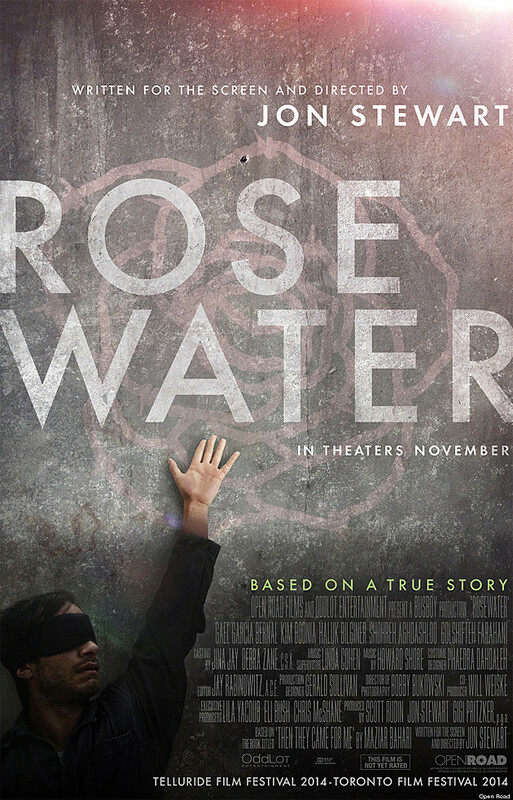 Though Rosewater is inspirational, has it’s heart in the right place and is outright funny at times, something I didn’t expect, though again, considering the writer/director, I probably should have, it is missing the oompha that could make it a really good political film rather than just an average one as it’s not a very moving or probably understandable film to those who don’t really follow politics. The film begins 11 days before Maziar’s imprisonment, as the Iranian-Canadian “NewsWeek” reporter travels to Iran to report on the historic 2009 presidential election. When arriving at the airport, Bahari meets “Davood” (Dimitri Leonidas), a taxi driver who helps him get access to parts of Tehran where the different political factions reside. They interview a young supporter “Alireza” (Amir El-Masry) for Ahmadinejad (president at the time) who furiously denies that Western media’s reports of possible vote rigging in the upcoming election are true. Then Davood brings Bahari to see another side, a group of young Mousavi supporters. These “dissenters” have formed their own system of education known as “Dish University,” a set of illegally obtained satellite dishes streaming in news from around the globe. As we follow along to the election sites I can only tell you this…after seeing our own elections the other day, we should be ashamed we don’t take this privilege for what it’s worth as you can see what it’s like when they actually do..though that would be the only thing I could see they have one upped us on as we know from history, the elections themselves don’t go well and demonstrations in the street ensue with not only many deaths, but arrests as well. The heart of this true story is what happens when Maziar is arrested and imprisoned for being a ‘Western spy’. He is put in the prison’s solitary confinement and interrogation rooms, subjected arbitrarily to absurd lines of questions, harsh beatings and other methods of torture by the prisons main information extractor “Rosewater” (Kim Bodnia). While Maziar’s attitude shifts between amused, confused, hopeless, hopeful, and even suicidal, he is visited by the spirits of his long dead father “Baba Akbar” (Haluk Bilginer) who was imprisoned during previous regimes, and his sister “Maryam” (Golshifteh Farahani) again, also imprisoned for a long spell, whom he has long conversations with over what to do. In the end, he gives a forced confession though it ends up not being satisfactory, it did bring him to the attention of the world. Along with everything his very pregnant, British wife, “Paola” (Claire Foy) does on her behalf, and his mother “Moloojoon” (Shohreh Aghdashloo) vigilance, the next thing we see is Hillary Clinton speaking about him on worldwide TV condemning his imprisonment, demanding his release and them bowing down to the pressure of the situation to do so. Performance wise, this movie really doesn’t do anything in a standout way, which let’s face it, it could have. As a Gael fan, I questioned at times the choice for him in this role, but maybe that’s because I’m so used to him playing the roles he is 100% suited for. While I liked this movie, with its jarring tonal shifts, it doesn’t deliver on the tone I thought it would. I think it will go over well with a political savy Jon Stewart crowd, but not much beyond that.